These Alcatraz pictures are here for your enjoyment, to check out what it looks like before you go - or to remember your visit afterward. Alcatraz Cruises is the only way to get to Alcatraz from San Francisco. Today, tour boats leave for Alcatraz from Pier 33. Historically, the guards, their families, and visitors left about a mile west of here at Fort Mason. Prisoners arrived by train car and barge. This picture shows an Alcatraz Cruises boat. These barracks were built 1905, when the army added three stories on top of an existing building. When the military outpost became a prison, it was converted into apartments for the prison guards and their families. This is what Alcatraz looks like from above - taken from a small airplane. Alcatraz is the summer nesting-place for western gulls, who build almost 500 nests on Alcatraz and raise their chicks here. Designed by Major Reuben B. Turner, the Alcatraz cell house was the world's largest concrete-reinforced building when it was completed in 1912. With central steam heat, skylights and electric lights, it was considered a very modern place. When the Bureau of Prisons took over, they made it more escape-proof with tool-proof steel bars and gun galleries at the ends of the building. Prisoners were assigned to private cells and provided with only basics: clothing, food, water and medical care. These cells are about 9 feet by 5 feet, and prisoners spent up to 20 hours a day in them. These cells, known as "the hole" were used to discipline inmates who broke the rules. Each cell had two parts: a solid front door and a second door with bars that you can see inside. When the solid door was closed the cell became completely dark. Bank robber and murderer Clarence Young proved to be such a difficult prisoner to manage that he spent 22 months in one of these cells. After he killed fellow inmate Rufus McCain in 1940, his lawyer claimed that the time spent in solitary drove him to commit the killing. The hospital wing isn't always open, but if it is, it's well worth a look. © Betsy Malloy Photography. Used by Permission. This house once had 17 rooms, and is the original home of the Alcatraz military commander. When Alcatraz became a prison, James A. Johnston was the first warden to live here. Unfortunately, the house burned down in 1970. The original Alcatraz Lighthouse was the first one built on the west coast. In 1909, this 84-foot concrete tower replaced the original, which was damaged in the 1906 earthquake. On the day of my visit, the wind was blowing so hard out here that I thought I might get blown right out to sea. This place was a rare sight for those held in segregation, who only got out here once a week. This photo was taken from the west side of the island. 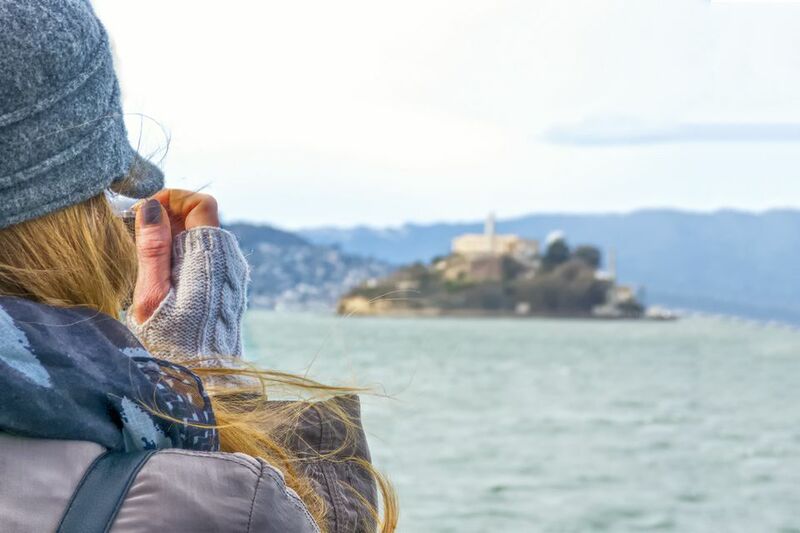 Alcatraz is just a 15-minute boat ride from San Francisco.